Functional Dimensions of Ape-Human Discourse asks the question ‘what do interactions between apes and humans mediated by language tell us?’. In order to answer this question the authors explore language-in-context, drawing on a multi-leveled, multi-functional linguistics. The levels are context of culture, context of situation, semantics, lexicogrammar, and phonology; and the functions are ideational, interpersonal, and textual. 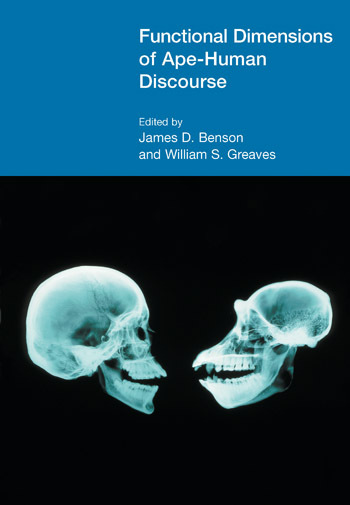 Chapter One discusses a negotiation between the bonobo Kanzi and Sue Savage-Rumbaugh in terms of discourse-semantics and the ideational and interpersonal metafunctions of lexicogrammar. Chapter Two reinterprets Sue Savage-Rumbaugh et. al. Language Comprehension in Ape and Child (1993) in terms of the ideational metafunction, and provides corroborative evidence for Kanzi’s symbolic processing abilities, opening a window into the consciousness of at least one non-human primate. Chapter Three compares three snapshots from comprehensive studies based on large amounts of data (monkey calls, language development in a human child, and a dialogue between Kanzi’s sibling Panbanisha and Sue Savage-Rumbaugh) from an evolutionary perspective, showing different ways in which the level of grammar comes to be wedged in between semantics and expression. Chapter Four articulates a methodology incorporating public domain software for the comprehensive analysis of ape-human interaction. Although bonobo-human interaction is used as an example, the methodology could be utilized for studies of chimpanzees, gorillas, and orangutans.